Never wake a sleepwalker? It’s a myth! It’s a commonly held belief that you should never wake a sleepwalker. People hold it as generally true when in fact it is not so. Why do people believe you should never wake a sleepwalker? The reason why people think you should never wake a sleep walker is they believe the shock of being woken mid-ramble could cause the sleeper to have a heart attack. In reality being woken as you sleep walk is no more shocking or frightening than being woken by a loud noise when asleep in bed. Of course you are likely to be very disorientated and confused. What exactly am I doing in the street in my pyjamas? It seems that is a good reason not to sleep naked. What should you do with a sleepwalker? To say you should never wake a sleepwalker is incorrect, but it makes sense to gently guide them back to their bed without waking them. They are sure to be disorientated if you wake them. What if they decide in their confusion that you are a burglar and they try and hit you? Leaving them to wander around is also not a good idea. A sleep walker tends to be a little clumsy. They could hurt themselves and it better to return them safely to their bed. Once back in bed they should stay there. It is unlikely that they will walk a second time in one night. Some sleep walkers can get up to strange behaviour. Eating in their sleep is a common one. The next day they are surprised to find juice spilled down the front of their pyjamas, crumbs spilled on the floor, or bitemarks in the cheese. Adults have been known to try to drive somewhere. Waking up in the car half dressed trying to start the ignition is very alarming (true story!). On the darker side there have even been acts of murder committed by sleepwalkers! Thankfully it’s definitely not the norm. Do you need to treat sleepwalking? Sleepwalking is more common in children, and most grow out of it by the time they reach adulthood. In most instances no treatment is required. If it is resulting in dangerous or embarrassing situations, or is disruptive to the sleeper and family, then one should seek treatment. This could mean identifying if there is an underlying cause. Treatment could include medication, therapy, or even hypnosis. 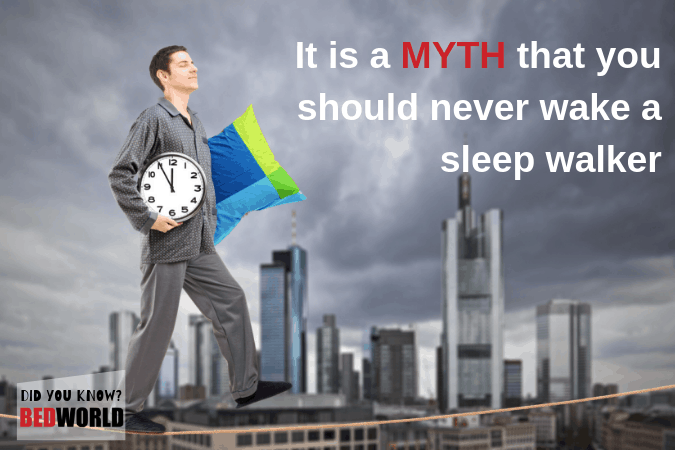 It is a myth that you should never wake a sleepwalker. Get them back to bed safely and gently but you don’t need to worry that waking them will harm them. If you aren’t getting a great night’s sleep, maybe it is time for a new bed? Speak to one of our consultants for advice. You can also explore our great specials here.